The Road to Broadway and Beyond: Disney’s Aladdin: A Whole New World is the latest release by Disney that focuses on the very successful translation of a film to the Broadway stage. Author Michael Lassell has authored similar books on Tarzan, Aida, Mary Poppins and the Little Mermaid. I’ve never seen a Broadway production, so I wondered if the book would be enjoyable for someone like me. That being said, the book is stunning. The production is top-notch and the full-color photos really show the actor and the sets in a hi-definition format. The book really is beautiful. There are quite a few fold out pages that show an amazing amount of detail. The pages are quite thick and feel substantial. But let’s talk about the contents of the book! The first section of the book is about the design of the production. This was the part that wasn’t as interesting to me; I really do not have any type of background in theater and a lot of the terms were lost on me. Still, I learned quite a bit about how much work goes into a production of this scale. There are interviews with the key designers and they really go in-depth with the individual trades and disciplines of the craft. I have to admit that a theatrical production is so much more than simply taking a well-loved film and putting it on stage. A lot of the key players discuss how much they loved the film and wanted to do it justice without copying the film. In actuality, it would be near impossible to recreate the film on the Broadway stage. Reading about the number of changes was inspiring and quite mind-boggling. 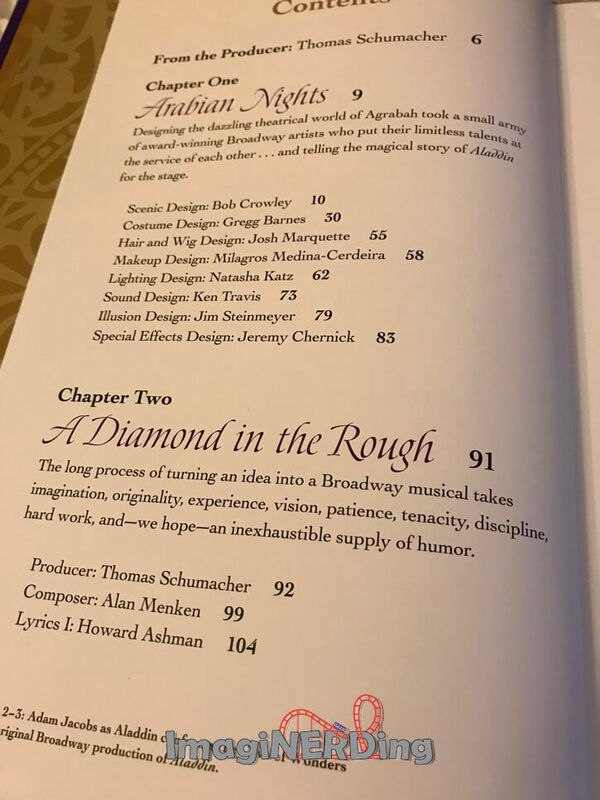 The second part of the book: A Diamond in the Rough, was my favorite section. 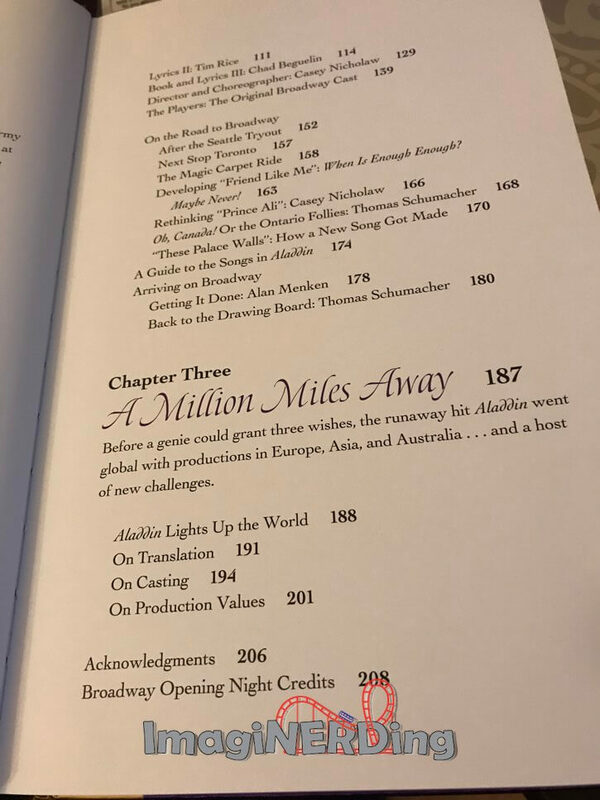 This section offered anecdotes from the major players about bringing Aladdin to the stage; from the semi-humble beginnings as a production in Seattle to full-blown shows all over the world. 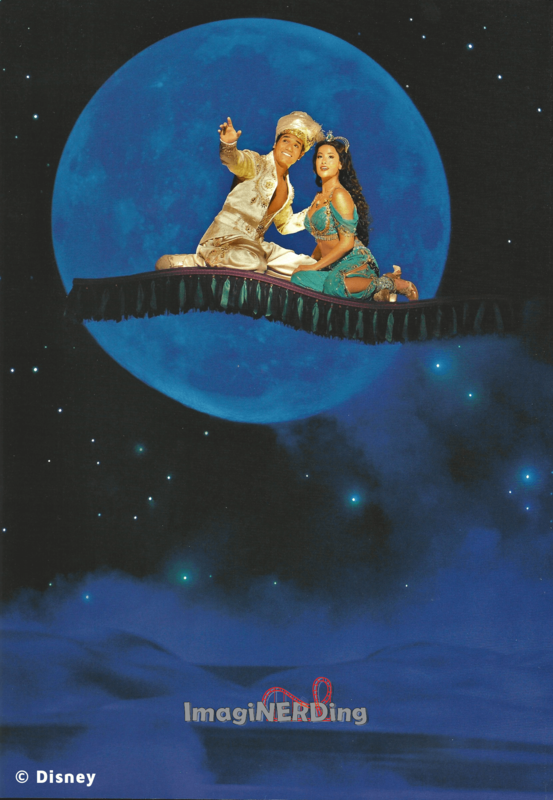 The original idea for Aladdin was to create a two-act performance that could be put on by community groups. According to Thomas Schumacher, licensing the plays and musicals is where a lot of revenue comes in. During the second section, you hear from Thomas Schumacher, Alan Menken, Tim Rice, Chad Beguelin, Casey Nicholaw and so many more. The insight offered by these major players inside and outside of Disney is truly amazing and well worth the price of the book. As a researcher, I enjoyed the anecdotes as well as the cohesive tale that’s woven about the show and the multitude of artists involved. 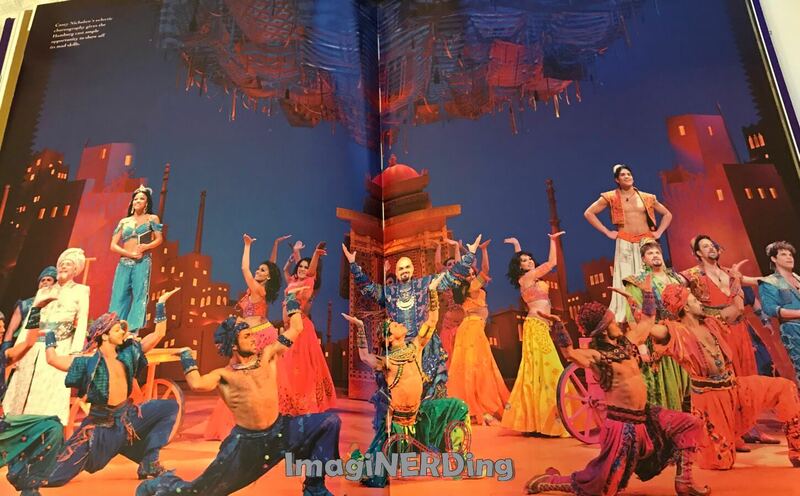 The third section of the book focuses on the various productions around the world, from Europe to Asia to Australia. You read about the different issues that arose from the different locations as well as how they had to localize each show. In the case of the Genie, it was obvious that a Robin Williams-inspired character wouldn’t work or translate very well. So, they found appropriate actors in their locales and told them to be themselves. Apparently, it worked like a charm. 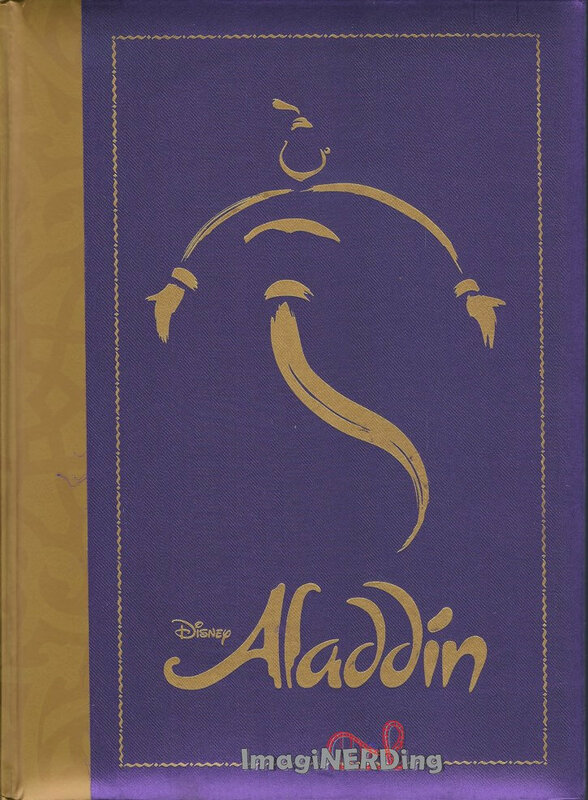 Overall, The Road to Broadway and Beyond: Disney’s Aladdin: A Whole New World is a gorgeous book that offers so much insight into what it takes to create, design, stage and produce a Broadway production. If you have any interest in Broadway or musicals, then this is a book you’ll want to get simply for the behind-the-scenes information. The book gives a much fuller idea of what happens long before the curtain ever rises. 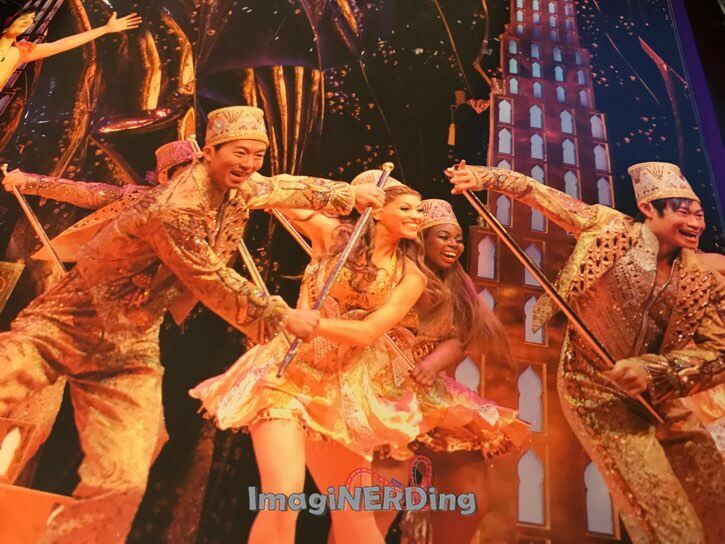 Are you going to buy The Road to Broadway and Beyond: Disney’s Aladdin: A Whole New World?